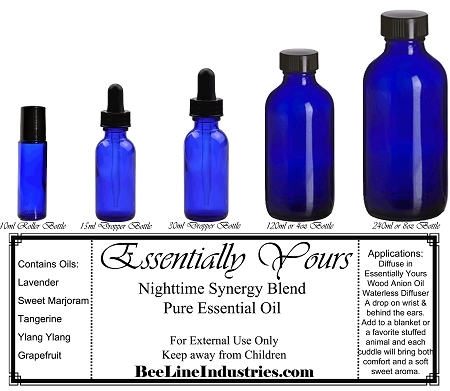 Contains Lavender (Lavandula angustifolia), Sweet Marjoram (Origanum majorana), Tangerine (Citrus reticulate), Ylang Ylang (Cananga odorata), Grapefruit (Citrus paradisi) Description Nighttime Nestling into the sheets and wrapping up in soft blankets as the day dissolves away can be precisely what we require. But those evenings when we wrangle to find relaxation can be pure anguish. Before you toss and turn, allow Nighttime’s tender aroma pacify you to slumber. A enjoyably cozy blend that encourages calm and rest. Nighttime retains layers of single oils, each with exceptional soothing properties that benefit you descend profoundly into the pillow. Applications Diffuse in intervals of 5 seconds on, 30 seconds off, with the Essentially Yours Wood Anion Oil Diffuser - Waterless, in your bedroom, or in your little one’s bedroom and turn on in the evening. Place a drop on each wrist and rub together. You can also take a drop and rub it behind your ears. You could also add a few drops to your blanket or on your little one's favorite stuffed animal or blankie and each cuddle will bring both comfort and a soft sweet aroma. Nestling into the sheets and wrapping up in soft blankets as the day dissolves away can be precisely what we require. But those evenings when we wrangle to find relaxation can be pure anguish. Before you toss and turn, allow Nighttime’s tender aroma pacify you to slumber. A enjoyably cozy blend that encourages calm and rest. Nighttime retains layers of single oils, each with exceptional soothing properties that benefit you descend profoundly into the pillow. Diffuse in intervals of 5 seconds on, 30 seconds off, with the Essentially Yours Wood Anion Oil Diffuser - Waterless, in your bedroom, or in your little one’s bedroom and turn on in the evening. Place a drop on each wrist and rub together. You can also take a drop and rub it behind your ears. You could also add a few drops to your blanket or on your little one's favorite stuffed animal or blankie and each cuddle will bring both comfort and a soft sweet aroma.